Women have a plethora of hairdos and styles to choose from – it’s practically endless! That’s the reason finding the right hairstyle can be really rewarding. The joy of discovering the perfect hairdo can take us instantly to cloud 9. Depending on whether our tresses are long, short or medium, and whether they are thick or sparse, we have to pick the hairdo that can aptly accentuate our features and complement our style statement. Without further ado, let’s take you to our hand-picked stylish updo hairstyles. STEP 1: Using the tail comb, make a deep side partition. Separate the crown part of the hair with the help of the tail comb. STEP 2: Secure the crown part of the hair using a sectioning clip. This will ensure that it won’t interfere with the styling of the lower section. Tease the lower section using the teasing comb to create a voluminous effect. STEP 3: Create a low side bun near the nape of your neck using the lower section. STEP 4: Release the crown section from the clip and tease its back for extra volume at the crown. Now smoothen the surface of the crown and brush it back towards the bun. Wrap the section around the bun. Tuck in the edges of the upper section around the bun using U-pins. STEP 5: Secure the flyways with bobby pins. Make the hairdo stay in place with a light-hold hairspray. STEP 1: Use a pea-size amount of rework-able hold paste in your fingertips to slick down any major cowlicks. STEP 2: Start with a two-inch section of hair, twisting the section around itself into a tight coil. STEP 3: Once the coil is tight enough that the twist naturally forms a small bun, continue wrapping the bun up and toward your head. STEP 4: Pin the bun in place. STEP 5: Continue steps 2-4 until all of your hair is pinned up. STEP 1: Use the paddle brush to brush all your hair back. STEP 2: Tease the top of the crown with the teasing brush for extra volume. STEP 3: Gather all your hair at the back of your head and start twisting the length of your tresses. STEP 4: Loop the hair through a hair elastic to create a half loop updo. STEP 5: Spread the bun out and secure with U-pins. STEP 6: Pull out a few face-framing strands for a casual look. 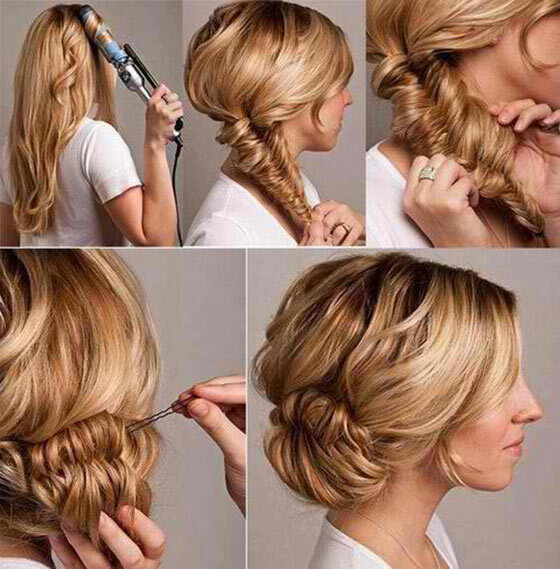 STEP 7: Finish with a light-hold hairspray to make the hairdo stay put. STEP 1: At the front of your face, use your fingers to create a two-inch section of hair on the left. 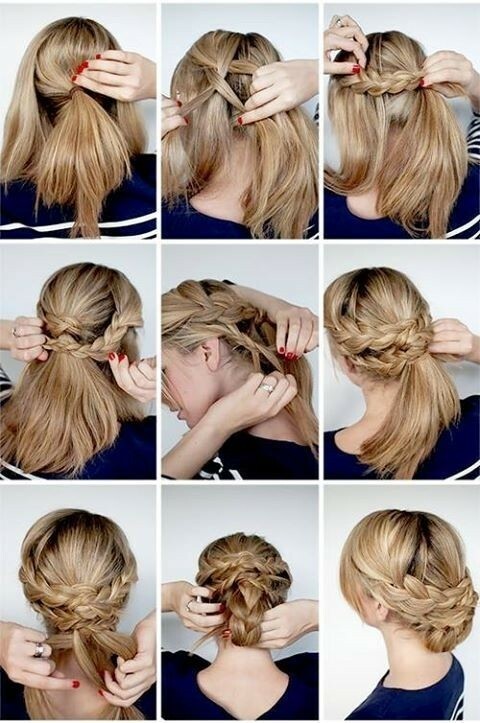 STEP 3: Secure the left braid with a mini hair elastic. STEP 4: Repeat Steps 1 and 2 on the right side of your head. STEP 5: For the look of a thicker braid, gently tug apart each braid using your finger tips. STEP 6: Section off the top of your hair and put it in a hair clip to keep it out of the way for now. STEP 7: Bring both braids around to the back of your head and secure them together with a mini hair elastic in the centre of your head. STEP 8: Take down the top section of hair and secure it into a half-up ponytail with a mini hair elastic at about the same spot as the elastic holding the braids together. STEP 9: Secure a bobby pin into the top elastic and thread it through the bottom elastic on the braids, then push it through to secure both elastics flat on the head. STEP 1: Take out two sections of your hair from each side of your head, just above the ears. 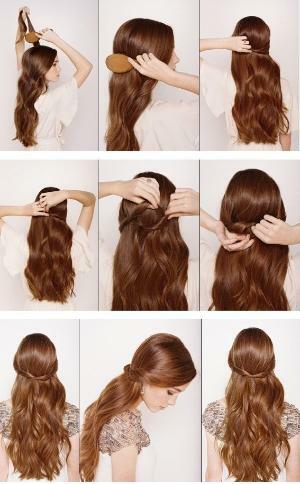 STEP 2: Now, gather the rest of your hair and tie it into a ponytail using a hair elastic. 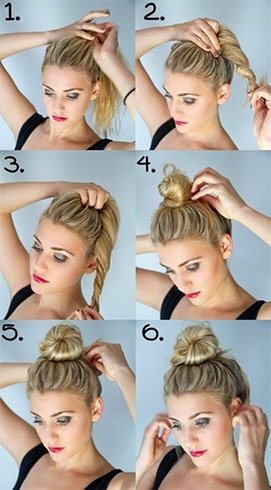 STEP 3: Wrap the ponytail around itself to create a low bun at the base of your head. STEP 4: Now start working the side sections into braids. STEP 5: Braid till you reach the end of the sections. STEP 6: Secure the ends of the braids using small hair elastics. STEP 7: Wrap the braids around the bun and secure them with U-pins. STEP 8: Tuck the flyways in using bobby pins. STEP 9: Finish with a hairspray to make the hairdo stay.